Tourists looking forward to visiting Italy’s Cinque Terre may be limited by new proposals capping the number of visitors allowed into the area. Restrictions limiting the number of visitors into the World Heritage Site have been proposed, and may be implemented as early as this summer. Residents in the picturesque cliff side towns say the area has been completely overwhelmed by tourists. In 2015, over 2.5 million visitors poured into the Cinque Terre. The new restrictions will cap the number of visitors at 1.5 million. Proposals include a system of ticket sales, which will be necessary in order to enter the region. The idea is that tickets will be sold online, although as of now the system has not been implemented. The Parco Nazionale delle Cinque Terre says the “last touches” are being made to the website, and visitors will soon be able to buy “Cinque Terre cards” online. Many in the tourism industry believe, as with most things in Italy, it will take longer than expected. The new proposals also include a system that will monitor the number of people arriving to the area, linked to an app that will show the number of visitors and congested areas in real time. Currently, roads leading to five towns are being fitted with devices to gauge the number of people heading towards them. While many local businesses welcome tourists, they say that things have gotten out of control in the past few years. Residents say day trippers from cruise ships are a particular problem, visiting for the day and leaving behind destruction in their wake. In 2014, more than 470,000 cruise ship passengers visited the villages, with numbers for 2015 estimated at 650,000. Last year, the number of cruise ship visitors alone would be almost half of the proposed new limit. Only reachable by steep, winding roads, local trains, or by sea, the Cinque Terre used to be a remote backwater. In the past decade or so, tourist volume has been steadily rising. The sharp increase in the numbers is partly due to the result of cruise liners adding this and other coastal Italian towns to their itineraries. The increase is also likely due to the common use of travel sites, which make lesser-known destinations known to any web surfer. 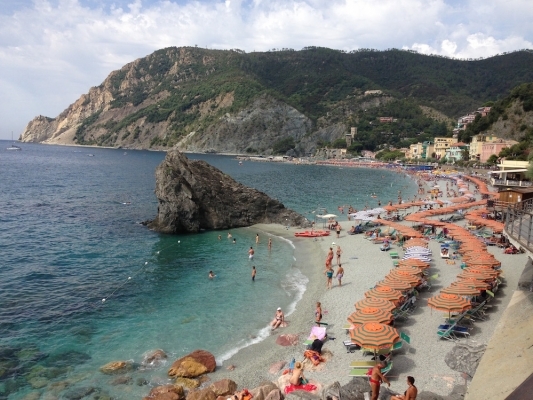 It is easy to see why the Cinque Terre has become such a popular destination. The brightly colored houses, local Ligurian cuisine, sparkling blue waters and picturesque hiking trails linking the towns make for a lovely holiday. But officials says the rugged coastal areas and villages are being ruined by the number of visitors. With these new measures, the Cinque Terre joins the growing list of destinations that are cutting back or limiting tourists. The list of places that have proposed or implemented restrictions includes: Venice, Bhutan, Machu Picchu, Iceland, the Galapagos Islands, Lord Howe Island (Australia), Mt. Everest, the Seychelles (East Africa), and Antartica. Now more than ever, it’s important to plan well in advance for your next trip to Italy. Keep tuned to the Italian Concierge blog for travel tips and the latest in Italy travel news!